Who Are Behind Rwanda’s Doing Business Success? On October 31, the World Bank released its annual 2019 “Doing Business” report – ranking Rwanda 29th globally and 2nd in Africa. The report indicates a historic performance in terms of improvement the country attained in ease of doing business. The country was also singled out as the only low-income country in the first 100 countries. The latest position, moves Rwanda from 150th position in 2008 – marking a crucial step. But who is the team behind these Doing Business reforms? On Thursday, KT Press took this curious question to Rwanda Development Board (RDB) headquarters in the capital Kigali and learnt that all these reforms are a collective efforts by line ministries and institutions while RDB is the custodian of Rwanda’s Doing Business reforms, among others. Around 8:45 am, KT Press arrived at RDB offices and met Karim Tushabe – the Board’s legal consultant and head of Doing Business Unit. Tushabe sits in his office alone. There is no space for other staff, not even a secretary – a scenario that drives one to question whether Tushabe conducts all the reforms alone. In an exclusive interview, Tushabe told KT Press details of how he operates. KPress: Do you have a team who work under your office? Tushabe: “I don’t have a team under my office (laughter) but I have people I work with. I have people I work with in Rwanda Revenue Authority, I have people I work with in the Private Sector and besides that I also do basic research. For instance, when a report comes, it shows where Rwanda is doing well and where we have issues. Once I see the negative side where we have issues, I know what to work on. KPress: How does one person coordinate all this? Tushabe: There is a structure right from the top. We have the National Doing Business Steering committee which is chaired by the Minister of Trade. In that office we have got several Ministries and institutions especially those whose mandate is related to business. 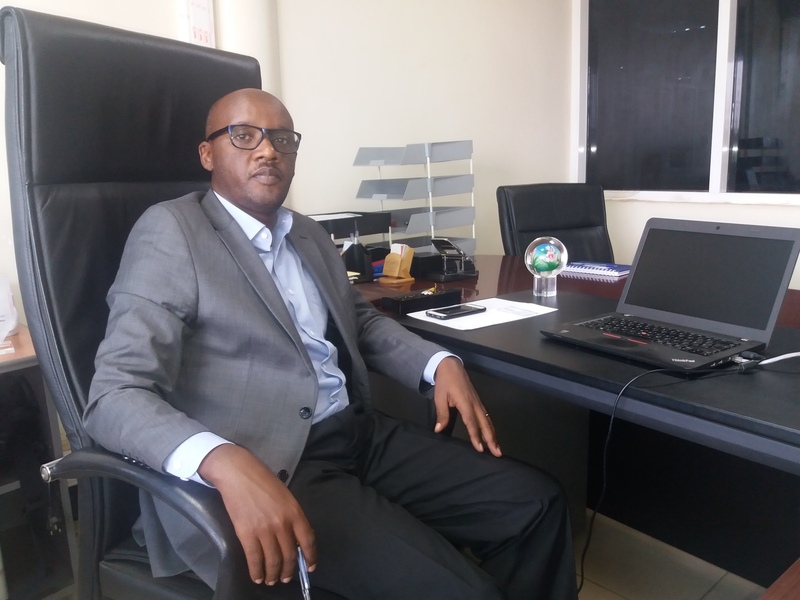 For instance, the Ministries of Finance, Infrastructure, Local Government; Public service, Mayor of the City of Kigali; Central Bank Governor; Commissioner General of Rwanda Revenue Authority, Director General of Lands and of course our CEO (RDB) who is a member and we also have Rwanda Social Security Board (RSSB). All those form the National Steering Committee and we sit in as the secretariat. Those are the people who take final decisions. KT Press: What is the task under your office? Tushabe: My task is to identify reforms. Once I identify them, I share them with stakeholders in the World Bank’s 10 indicators of Doing Business Reforms. Those people will look at those reforms and see whether they are viable because I am not an expert in everything. I may pick a reform because I have seen Singapore doing it but when actually we can not manage. Once they receive my proposals, they make decisions on whether they can be done or not and I have to defend my proposals. I make justifications whenever I am proposing these reforms to stakeholders. For instance, I must tell them if we do this we can get that. We consolidate all that and put them in an action plan. I submit it to the CEO for approval who submits it to the steering committee. Once they confirm then the minister of Trade submits it to the cabinet to be adopted. Once it is out of cabinet I begin knocking at everyone’s door telling them to start implementation process. KT Press: How quick is the process and how often do you meet these people you work with? Tushabe: We have got a very efficient way of working. Most of the time you can see that I work in my office alone, but I am always on the internet. We don’t really often meet. We used to meet back between 2008 and 2010 because people were not yet aware about what Doing Business is but today, they clearly understand the concept. Today, we all coordinate on emails but we meet twice a year on a technical level. For example, we plan to meet on 14th this month as the steering committee. We also meet once we are presenting the action plan and later meet when they are assessing what has been covered before submitting our report to Washington. But at times, when there are some weaknesses in some institutions in delivering, we can call for a meeting to be sanctioned and people can be reminded. KT Press: What is the timeline of sending a report to Washington? Tushabe: It is always an annual assessment. For instance, the latest report was published in October but the closing is always on April 30th. It used to be the end of May but because the Bank had a lot to assess, they pushed the deadline back to April. So after April we start another calendar year. That is why the latest report is called the 2019 before reaching there. We are now working on 2020 report. So the calendar captures from April to April. Any reform made outside this period can not be captured in the report. Right now we are working on reports that will be submitted in April. This means that the latest report came when we had already started working on another one. We are going to assess it and see where we fall short and see what we can do. Between November up to March, that is when we are implementing. KT Press: Have you ever missed the deadline to submit your report to Washington? Tushabe: Yes. It is not easy to always be on time at 100%. We always make it at about 90%, but at times you might not get exactly what you want, like if you are dealing with the introduction of the new system and you are required to hire foreign expatriates and others. But good enough we are always above 90% in meeting our targets. KT Press: Did you predict that Rwanda would be ranked 29th during this year’s report? Tushabe: Not this year. It was our target to rank Rwanda among top 30 by the year 2020. We are happy to have made it ahead of our target. Because it is a competition, you can not go out and start publishing it, but internally we had our own target. KT Press: Had you suspected that Rwanda would get the latest score? Tushabe: The World Bank circulates preliminary reports that show your performance so that when you have an issue like they omitted to capture one of the reforms you can claim. So we saw that we are going to do better but we could not know how better because it is a competition and they send your own report and not what other countries have done. KT Press: You said you have set the pace to never go back in terms of ranking. What is your predictions regarding the next ranking? Tushabe: That is the government policy. In everything the government does it has to keep moving forward. There is no going back. We follow that policy. KT Press: What challenges do you encounter along the way? Tushabe: The mindset is always a challenge. In every society, change is not easily taken. I can’t say it is a big challenge because people have now know what Doing Business is and the benefits. The other challenge is communication. We do communication right but, I believe it is not enough. We need to do more in terms of sensitization on those reforms. KT Press: What keeps you awake towards the exact period of releasing that report? Tushabe: Oh yes. When you are doing the reforms, not all of them have got equal weight. I can have about 20 reforms to work on, but when I am singling out what can give us a big push, that becomes difficult. For instance, last year in March, we couldn’t sleep because all along, Rwanda was ranking poorly in terms of electricity access. This was a very big challenge. But later we got to know what is required. Our engineers in Rwanda Energy Group were working around the clock to make sure they beat the deadline. I was looking at it in a way that if we fail in these reforms and do better in others, where are we going to have more marks? You understand we are 2nd globally in land reforms. Even if you did better in land reforms, that is small. But when you are ranked in 119 and you are looking at getting to 50s, then it is not easy and remember we were dealing with scientific things where you have to know the process. That was one of the reforms that made me lose sleep not until we got to know that we have made it. We even went to Washington to defend it on the panel of experts and we did it. When I saw them nodding their heads positively, I knew that we had made it and we have ranked from 119 to 68.